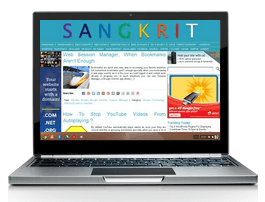 SANGKRIT.net was not born in one go. It has always been busy being born and gradually it got mandated for domains, WordPress and AdSense. Now we are about to disrupt the space occupied by so-called PR companies worldwide not because we want to make all the money they used to make but because what they are doing to their clients has now become all rubbish. We want all individuals registering their domains for doing business upon internet by using WordPress and we are simply integrating that possibility to get distributed worldwide from here with great geek support system like Shardul Pandey Talks so that it is not made mere a dumb domineer system. We are doing the same old business so differently. This matters most. If you register a domain, install WordPress and start blogging religiously about everything you come across, gradually you are sure to come across your true business what is used to be called karma in ancient-most civilization. Then you will get some plugin from the great repository to let it go that way or may be you end up developing the best one for your business. Thereafter also keep on reinventing yourself till you are mandated for whatever you do. This you will have to do many more times again also. Today Nokia is being sold out to Microsoft just because it failed in reinventing itself unlike what Hewlett Packard or Apple successfully did many times through their business cycles.